The story begins in 1948 on Carpinteria’s north western outskirts. The owner of a five-stool juice stand met an artistic motorist. For the sum of $500, the legendary Santa statue was born. This collaboration quickly grew into a Santa-driven seaside mall gaining national prominence. 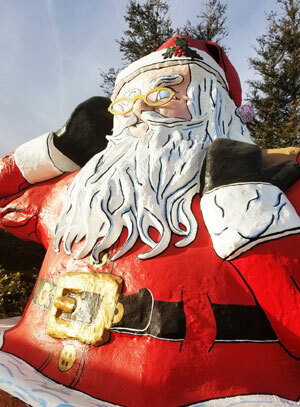 In 2003 the new landlord of Santa Claus Lane decided that Santa was no longer the right image, and planned to dismantle the statue. The search began for the Santa statue’s new home. Mike Barber, Race Founder for Santa to the Sea, teamed with the Garden Acres Mutual Water Company to ‘stand up for a homeless Santa’. Between the donations coming in, and the local artists and craftsmen volunteering their time and talents, the plan to move Santa was in motion. In January of that same year Santa moved into his new digs off the 101 Freeway in Nyeland Acres. In 2008, the Santa To The Sea Half Marathon, and the Childrens’ Christmas Fundraiser were successfully launched, beginning a tradition. A tradition that is destined to last, at least as long as Santa.